It frequently astounds me no matter where I go people say, “It’s my fault I’ve got a sore back, or a sore neck – I have such lousy posture”. But surely if good posture was so good for us – wouldn’t it be easier to maintain? There’s no debate on the negative effects of sitting for long periods of time. The human body needs to move. However, even though it’s not good for us – the modern world requires many of us to work in sedentary postures for extended lengths of time –especially at computers. We also know it’s impossible to maintain this posture. Why do humans find it so hard to sit up straight for long periods of time? It’s not hard to maintain a comfortable upright posture when we’re standing. So, why is it so hard to have an upright posture when we’re sitting? Standing up straight is a functional human posture. It’s natural and it doesn’t take any conscious effort to maintain. This is not the case for sitting up-straight for long periods of time. Just because it’s natural to stand up straight, doesn’t mean it’s natural to have your back in the same position when you sit. Click here for a brief introduction on seated posture from our First Move Office programme. 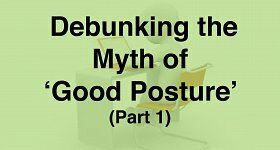 This is Part One in a series of articles I’m going to be doing on what a good posture really is. Keep an eye out for Part Two next month which will further explain why we’re not designed to sit up straight.